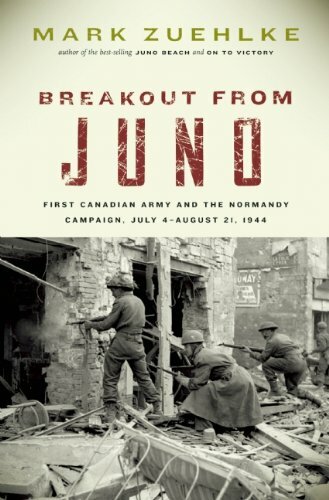 The ninth book in the Canadian Battle Series, Breakout from Juno, is the first dramatic chronicling of Canada’s pivotal role throughout the entire Normandy Campaign following the D-Day landings. On July 4, 1944, the 3rd Canadian Infantry Division won the village of Carpiquet but not the adjacent airfield. Instead of a speedy victory, the men faced a bloody fight. The Canadians advanced relentlessly against Hitler’s finest armoured divisions, at a great cost in bloodshed. Initially, only the 3rd Division was involved, but in a couple of weeks two other Canadian divisions — 2nd Infantry and 4th Armoured — along with a Polish division and several British divisions came together as First Canadian Army. While their generals wrangled and planned, the soldiers fought within a narrow landscape extending a mere 21 miles from Caen to Falaise. The Canadians won a two-day battle for Verriï¿½res Ridge starting on July 21, costing them 1,500 casualties. More bloody battles followed, until finally, on August 21, the narrowing gap that had been developing at Falaise closed when American and Canadian troops shook hands. The German army in Normandy had been destroyed, only 18,000 of about 400,000 men escaping. The Allies suffered 206,000 casualties, of which 18,444 were Canadians. Les Fusiliers de Mont Royal looking into mine shaft used by German troops for infiltration purposes, between Saint-André-sur-Orne and May-sur-Orne, France, 9 August 1944.